The Office of Innovation for Education has worked with Star City Schools for several years. Star City High School and Middle School are both Schools of Innovation (SOI), but you will see innovation throughout the entire district. Their innovation includes, but is not limited to, course offerings, approach to culture, scheduling, and blended learning. Visiting the district over the years, we have noticed that their environment stands out as a positive place where students want to learn and grow. Therefore, we interviewed some of the people who are playing a key role in ensuring that Star City has and maintains a positive environment for students, teachers, parents, and the community. Get to know these people, as they are an example of people who are making a difference in the lives of Arkansas students. Jon has a Masters and Ed Specialist degree in Ed. Leadership. He and his wife, Meghan, have 1 son named Miller (9). He enjoys reading, engaging in his #PLN on Twitter and is a member of the Arkansas Association of Educational Administrators. In 2014, Jon completed Leader-to-Leader for Principals at the Arkansas Center for Executive Leadership, which he claims “sparked” his innovative mindset. In his 3 years as the Superintendent of Star City Schools, he has helped to develop 2 SOI’s, and oversaw the creation of the conversion charter school which was made possible through a grant by The Walton Family Foundation and The Arkansas Department of Education. 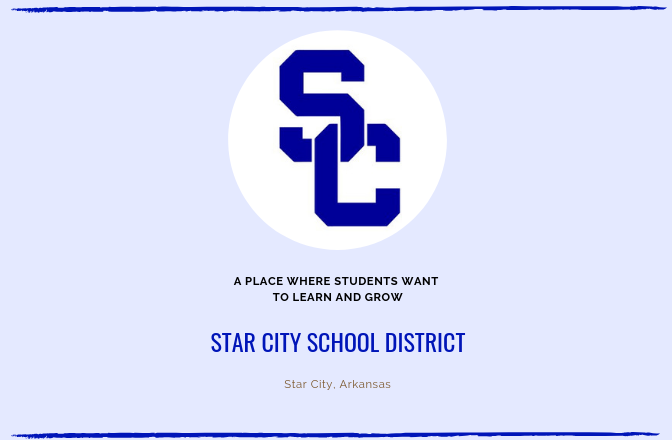 Jon is proud to say that Star City is providing “the best PK-12 STEM education in Arkansas” and credits their positive environment to loving their “passengers” (students and staff) and “driving” with purpose. Jon is a prime example of what it means to be a leader. When asked to highlight him, he said yes AND I want you to highlight others in my district. He understands that effective leaders grow more leaders. I grew up in Bradley County. I graduated from Hermitage High School and education has changed my life. I am so fortunate to have had the opportunity to break the cycle of poverty and obtain my teaching degree, my Ed. Leadership degree, and complete a Superintendent Program of Study, all from the University of Arkansas at Monticello. Go Weevils! I currently get to serve as the middle school Principal and as the secondary STEM Curriculum Coordinator. Both are truly jobs which I love to do each and every day. I working with amazing teachers and staff who are dedicated to providing unbelievable opportunities for our students. I am a book nerd!!! I read every day. What are you most proud of at your district/school(s)? The students!!! They are the reason behind everything we do. We drive our success behind their success with a positive mindset. Tell us your secret to creating a learning environment that promotes learner engagement? 1) Star City Middle School are an Energy Bus School. 2) Our district and our school have a clear mission and vision. 3) Learning opportunities for students through curriculum choices such as PLTW, Ready & iReady Curriculum, RISE, Empowering Writers. Using great tools and looking at innovation such as Google Classroom, personalized and blended learning, stations, flex seating, etc. 4) Working outside the box – Master schedule, RtI, Advisory, etc. I have lived in Arkansas my entire life, not ever thinking for one second that I would move out of state. I have deep Arkansas roots and love the scenery that our state has to offer. I grew up in Star City, AR and went to school right here at SCMS. I graduated high school in 2011 from Star City High School. My mother has been in education for over 25 years, she taught at Jimmy Brown Elementary for most of my childhood and is now the Coordinator for Early Childhood Special Education in Southeast AR. She really inspired me to become a teacher, I just took a long way around to get here. I have a bachelors in Forest Resources from the University of Arkansas at Monticello, this field of study sparked my passion for environmental sciences. Throughout college, I had several jobs, one of them I conducted research on soybeans and grain sorghum to run an analysis for biofuel studies. Another job I held there was helping for our forest manager teach a dendrology course on campus and also helped maintain the university forestland by bush-hogging and helping with controlled burns. From there I went to work for the Department of Parks and Tourism as an interpreter. I did many school visits and public educational programs, this job ignited a passion for teaching. After some soul searching I decided to apply for the MAT program at UAM so I could spend more time in the classroom teaching my favorite subject, science. I graduated with my Master’s in Arts and Teaching in 2018. I just recently started on my second Master’s in Science Education with a certificate in STEM Education from Northeastern State University in Oklahoma. I started racing karts when I was 6 years old and this hobby transpired into me racing full-sized cars by the time I was in middle school. I have been on ESPN five different times for races that I have been at, I hold over 11 track championships and still hold the fastest lap time for a female kart driver. I am SO proud of the changes that have been made since I was a student here at SCMS. Students have so many new and exciting classes offered to them that were nonexistent when I was a student here. Classes like Magic of Electrons, Science of Technology, Recreational PE, are all classes that I would have loved to take and I am so happy that young girls have the opportunity to learn about the fields of science before they go to college. I really try to build personal relationships with my students. I have taken up an interest inventory at the beginning of the school year with ideas of science experiments that they would like to do (within reason) and I find ways to incorporate their ideas into my lessons. The teamwork and willingness to embrace new ideas. I’m surrounded by an amazing team that is always willing to step out on faith with me to try a new idea. We work together to find creative solutions or options to make sure our students succeed. We truly believe in #whateverittakes ! Tell us your secret to create a learning environment that promotes learner engagement? Students want and need an environment that they feel respected in. The best way to build that environment is to build a relationship with the student. They’re a person outside of your classroom and you should get to know them! I was born and raised for most of my childhood in Watson Chapel, AR. When I was in the 8th grade, I moved to Star City. I graduated from Star City High in 2000. I graduated from the University of Arkansas in Monticello with a Bachelors in Early Childhood / Special Education degree in 2005. My first job was for the Woodlawn School district from 2005-2007. I married my husband, Jonathan, in 2006. I then began working on my Masters in Learning Systems Technology from UALR which I completed in 2008 while working for First Step Arkansas (2007-2010). When my daughter, Gracie, was born in 2010, I decided that I wanted to return to the public school system, so I went back to my first school while growing up, Watson Chapel School district (2010-2012). While there I completed my 2nd master’s degree in school counseling from UALR. In 2012, I was offered the opportunity to come back to my “home,” Star City. A few years later, in 2015, my son, Jon Wesley, was born. He attends the local daycare and Gracie is in school at Brown Elementary here in Star City. I love this town, this district, and all the opportunities that our students have. I am thankful for the amazing involvement that our community has in our sports and other electives. I love genealogy research! 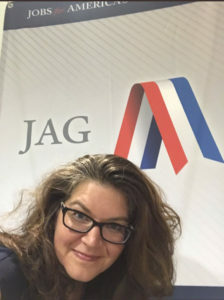 I will spend hours digging through DNA links, census records, and grave websites to find people missing in my family tree; or anyone’s for that matter. I’ve reconnected four adopted children with their biological parents. I am thrilled that our school has so many different learning opportunities for our students including K-12 PLTW, Certified Nursing Assistant classes, Environmental and Spatial Technologies (EAST) is offered from grades 7-12, welding, farming, robotics from grades 4-12, Star City Academy offers numerous virtual college classes, and beginning next year, we will have archery, hunters education, and boaters education courses. Our principals know our students’ names and their stories. When teachers go to our principals about a concern for a student, we are always asked if we are discussing “skill or will” and we are asked, “what is best for the student.” The principals will then call the student in and speak with them and get their input on what the need may be. They are amazing and have helped us to see a turn-around in several students. They also randomly leave notes on teachers doors to let them know that they are appreciated. I grew up in Hot Springs Village, Arkansas and went to Fountain Lake Schools K-12 grades. I have lived in Arkansas my entire life, although that has involved living in many different areas of our State. I hold a degree in Early Childhood Education P-4 and a Masters Degree in Counseling K-12. I have also earned numerous certifications and endorsements as well, including Special Education, which I worked in for many years. Before becoming an educator, I worked for years outside of the school system in various jobs, which I feel provides a slightly different perspective I pull from to help better prepare my students to enter the workforce. I have been married for 23 years. My husband also works in the school setting and is the Assistant Superintendent at White Hall Schools. We have an amazing son who is currently a Junior in High School. My parents still live in Hot Springs Village. They are both retired now and enjoying life together. My father worked as a Firefighter, Paramedic, and EMT and my mother worked at Fountain Lake Schools as the District Treasurer. I have an older sister who lives in Missouri with her husband and their five sons and a younger brother who lives in Benton, Arkansas with his wife and their 2 children. What can I say, I’m not really a “full of surprises” person. I love playing video games and canoeing, but I don’t think this would surprise anyone that knew me. Our commitment to meeting our students’ needs and offering them “outside of the box” options. As part of the School of Innovation, my classroom is completely designed around the students. This includes everything from the physical environment to the self-pacing of lessons. Special focus is given to encouraging and building a cooperative and respectful environment so that students feel valued, comfortable, and safe. Students are provided with daily support on an individual basis, depending on their needs. Overarching deadlines for sections are given in order to teach responsibility, but the pacing is actually left up to the students, which has worked out fantastically. They have taken true ownership of their own learning. They monitor their progress and growth as well as taking responsibility for their successes and any “failures” along the way. Olivia is a leader on campus. She participates in many extracurricular activities and maintains an excellent GPA. Her positive attitude is contagious and her peers mirror her behaviors. 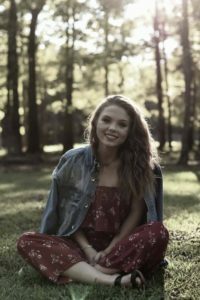 Olivia plans to earn a degree in Biology and continue her education to become a chiropractor. Her time in the Student Choice Academy has allowed her to explore career options and begin to plan her future. Donta is a student with a heart for service. He helps peers and teachers with any tasks asked. He also has an attitude that creates a positive experience for those around him. Donta always looks at the good side of every opportunity. 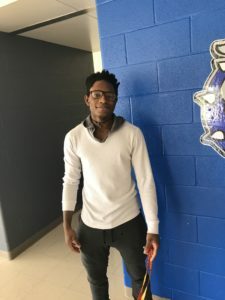 After graduation Donta plans to begin working as a CNA, having obtained his CNA licensure as a part of the first CNA class at SCHS. He will attend UAM where he plans to major in psychology and become a therapist.